Does this world’s darkness make you want to weep? 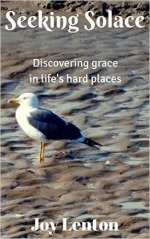 Do you feel overwhelmed at times by the brokenness and pain in your life? Me too. But we don’t have to despair, my friend. Because light and love are all around, seeping into our consciousness. And they are most apparent for those with eyes to see them. If we get locked into cynicism, grief and despair we may fail to see just how much God permeates this world with His light and love. Our vision can get warped and skewed by circumstances and situations not of our choosing. But if we look with eyes of faith, then we begin to see that life is more than 50 shades of grey, far more than 100 ways of being beige. There is light and life and love and colour just waiting to be discovered by hungry hearts. Because, filtering softly from dawn to dusk is an invitation to look beyond the immediate, to grasp hold of the eternal right here, right now, in our midst—an invitation to taste holy Mystery. And even when the darkness descends in such a way that it seems to temporarily blot out the sun, even then the Son of Righteousness Himself will rise in our minds and hearts when we turn in faith to Him. Hold on through the dark seasons. Keep the faith when you are faltering and struggling to believe. Because whether you can sense it or not, God is holding on to you and He won’t ever let you go. His greatest joy is to bring His love and light into your life, to turn mourning into joy, heal your brokenness and give you beauty for the ashes of your life. These words and haiku poems have been inspired by Poet Master Ronovan’s latest weekly haiku challenge of Love&Light. Just click on the link to see how it works and to read the great variety of posts being shared. Dear Bettie, I love your description of God’s “dripping, full heaviness of Love” because it so beautifully (and poetically) expresses the abundant, overflowing grace of that love for us. Thanks Joy! Yes it’s been an interesting ride publishing the book, and I’ve loved getting letters from people who’ve read it and heard God speak to their hearts through it. But now I’m a bit stumped about a sequel! Again, Joy, your words speak life to me. ‘Beauty for ashes’ – exactly the verse and words my pastor spoke over us last weekend when he came to pray with us after my sister’s death. Hugs.